WHAT'S THE BEST WAY? THREE OR FOUR WAYS TO HONOR THOSE WHO DIED DEFENDING. WHAT IS THE BEST. . . .? 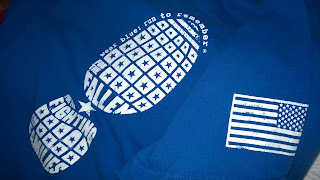 A great organization, Wear Blue: Run to Remember, burst into reality in the city of DuPont, WA a few years ago. I lived in DuPont at that time and grew accustomed to encountering scores of runners every Saturday. They ran to remember the fallen, to deal with their grief at losing spouses, and also to help surviving families of the fallen. Photo: My Run to Remember T shirt, which I wore many Saturdays in DuPont, when I lived there, and wear today, Memorial Day, 5/30/2016. Nostalgically, I recall chatting with a man wearing a "Run Blue" shirt in the local QFC grocery store in Bethany, Oregon, where I live now. We shared memories of DuPont and of "Wear Blue." DuPont was such a logical home base for Wear Blue. The city is located next to the giant Lewis-McChord Joint Base, including Army and Air Force installations. About forty percent of the population of DuPont consisted of active and retired military personnel and their families. Some people run to stay in shape. Others run to lose fat. But now, about 15,000 members of Wear Blue run worldwide to remember the fallen. The small band of originals in DuPont has burgeoned remarkably. Wear Blue! For sure. Yes, run to remember. When I think of Memorial Day, I remember those whom Run to Remember honors. Flags decorate memorial stones at Arlington National Cemetery. Public domain photo via Wikipedia. Earlier, my own special childhood memory of Memorial Day relates to people placing flowers on the graves around Spokane, WA. Tons of cut flowers and potted plants were placed in cemeteries in Spokane, WA. Not only on graves of veterans, and those of non-military deceased family members too. My grandmother sold flowers from her nursery gardens to people from all over the Spokane area. My mom, my brother and I were there to help her meet the huge demand for flowers. Yes! Let the jets roar, the bands play, the runners run. Let the politicians praise those killed in action. Let the priests and preachers bless the dead. Yes, indeed. At the same time, let us remember that many nation have their own memorial days. Those remembered in one nation may be the enemies the military people of another nation have killed. War takes lives. People die by the millions in majors wars. A reasonable person and every concerned national leader seeks to minimize violent warfare, even while pausing to praise those who died to save the nation. So, while thanking God for the sacrifices of the military dead, let us thank God for leaders around the world who seek peace between nations. Such leaders, working day in and day out every year, year after year, are the ones who truly honor the military dead.